A digital hyperlinked pdf copy of the book (shown below) is available for >49 site licences @ $8 per site licence (a reduction of 47%) for a signed 2 year contract period and free, for teachers' use for schools who purchase books for entire year groups. A CD with Word and pdf folio templates as well as a sample folio is also available for the school network for a one-off cost of $40. Many schools in the past have purchased the superseded edition of this book for all stage 4 students so that they can conveniently cover all of the syllabus requirements with minimum effort by the teacher. This book allows for the for co-ordination of all stage 4 Technology classes for the essential Design-related syllabus components so that common tests and grading can be done for all year 7 & 8 classes. 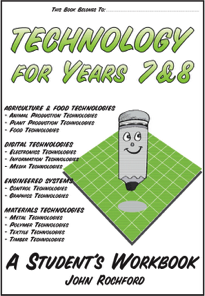 The Technology for Years 7 & 8 Workbook is available in digital form (subject to a signed copyright contract for a period of 2 years) for schools that require more than 59 site licences and wish to add the digital copy to the school network. Please note that a digital copy cost does not include the physical workbooks - schools must select one or the other or pay for both. This Workbook for the 2019 Technology (mandatory) National Curriculum syllabus aims to provide a logical approach for the presentation of the essential related theory content required for this course. All of the syllabus areas are presented in succinct, student-friendly language with little else for the teacher to do other than present the content and develop interesting practical projects & design briefs. Over 50,000 words, 670 illustrations, original user-friendly content and presentation makes this book a valuable addition for teachers wishing to present the course efficiently, with a minimum of effort and in the spirit of the syllabus. Design-related and technology-related areas are provided with relevant worksheets, assignments, review questions, safety tests with listed outcomes and Levels of Achievement to facilitate marking including the support of outcomes-based reporting. The Workbook allows for the logical presentation sequence of design: development of skills and knowledge in materials, tools, techniques and safety before designing and making design projects which require these skills. Purchase of the workbook by students in their book packs saves teachers time and the TAS faculty the expense of developing and copying handouts. It will also help co-ordinate presentation of the course by the faculty. Allows for the co-ordination of all stage 4 Technology classes for the essential components of the syllabus that are difficult to integrate into practical projects as well facilitating common tests and grading with all stage 4 Technology classes. 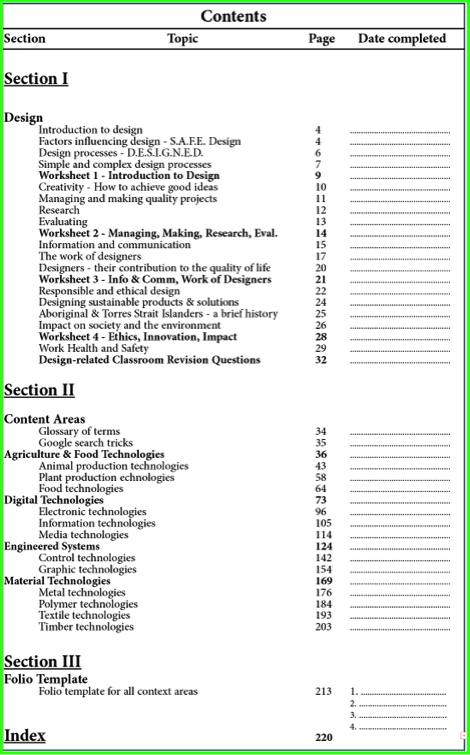 The main aim of this Workbook is to provide teachers with the 2019 National Curriculum prescribed Mandatory Technology syllabus content (with student activities) so that teachers can have time to develop context area design projects that are appropriate, informative, interesting and fun for students. The philosophy behind this book is similar to that used in other countries that have world leading educational systems such as Finland where the concept for teachers is less = more - the less 'administrivia' for teachers, the more time they have to assist students and develop effective lessons and projects. Airlines use the same philosophy - put the oxygen mask on yourself first so that you can assist others during the emergency!